Shankar is a popular Bangla pen man and his contributions to Bengali literature are immense. Notable pen down books are- Chowrangi, Simabaddha, Jono Aranya and three films were created based on the story of these three books. His first book was published in 1955, at a young age, this author got popularity by writing the book- 'Koto Ajanare'. Manishankar Mukhopadhyay is the original name of the author but the readers know him as Shankar. 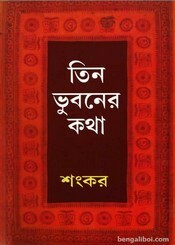 Now I want to share an another popular novel of his- 'Tin Bhuboner Katha' as pdf file. The pdf has 453 quality pages, 14mb file size.